Researchers at The Ohio State University are working to develop DNA nanostructures that deliver medicine to drug-resistant cancer cells. 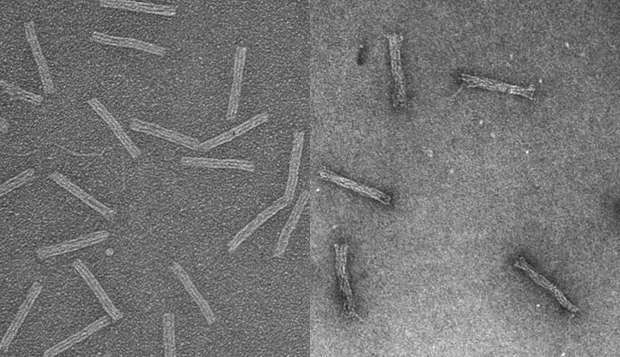 These electron microscope images show the structures empty (left) and loaded with the cancer drug daunorubicin (right). The researchers have demonstrated for the first time that such "DNA origami" structures can be used to treat drug-resistant leukemia cells. Credit: Randy Patton, The Ohio State University. In this case, the invading force is a common cancer drug. In laboratory tests, leukemia cells that had become resistant to the drug absorbed it and died when the drug was hidden in a capsule made of folded up DNA. Previously, other research groups have used the same packaging technique, known as "DNA origami," to foil drug resistance in solid tumors. This is the first time researchers have shown that the same technique works on drug-resistant leukemia cells. The researchers have since begun testing the capsule in mice, and hope to move on to human cancer trials within a few years. Their early results appear in the journal Small. The study involved a pre-clinical model of acute myeloid leukemia (AML) that has developed resistance against the drug daunorubicin. Specifically, when molecules of daunorubicin enter an AML cell, the cell recognizes them and pumps them back out through openings in the cell wall. It's a mechanism of resistance that study co-author John Byrd of The Ohio State University Wexner Medical Center compared to sump pumps that draw water from a basement. He and Carlos Castro, assistant professor of mechanical engineering, lead a collaboration focused on hiding daunorubicin inside a kind of molecular Trojan horse that can bypass the pumps so they can't eject the drug from the cell. "Cancer cells have novel ways of resisting drugs, like these pumps, and the exciting part of packaging the drug this way is that we can circumvent those defenses so that the drug accumulates in the cancer cell and causes it to die," said Byrd, a professor of internal medicine and director of the Division of Hematology. "Potentially, we can also tailor these structures to make them deliver drugs selectively to cancer cells and not to other parts of the body where they can cause side effects." "DNA origami nanostructures have a lot of potential for drug delivery, not just for making effective drug delivery vehicles, but enabling new ways to study drug delivery. For instance, we can vary the shape or mechanical stiffness of a structure very precisely and see how that affects entry into cells," said Castro, director of the Laboratory for Nanoengineering and Biodesign. In tests, the researchers found that AML cells, which had previously shown resistance to daunorubicin, effectively absorbed drug molecules when they were hidden inside tiny rod-shaped capsules made of DNA. Under the microscope, the researchers tracked the capsules inside the cells with fluorescent tags. In this time-lapse image, drug-resistant leukemia cells glow with fluorescent markers as they absorb DNA nanostructures containing the drug daunorubicin. Within 15 hours after absorbing the nanostructures, the cells begin to disintegrate (starting with the one in the lower left). Credit: Patrick Halley, The Ohio State University. Each capsule measures about 15 nanometers wide and 100 nanometers long—about 100 times smaller than the cancer cells it's designed to infiltrate. With four hollow, open-ended interior compartments, it looks less like a pill a human would swallow and more like an elongated cinder block. Postdoctoral researcher Christopher Lucas said that the design maximizes the surface area available to carry the drug. "The way daunorubicin works is it tucks into the cancer cell's DNA and prevents it from replicating. So we designed a capsule structure that would have lots of accessible DNA base-pairs for it to tuck into. When the capsule breaks down, the drug molecules are freed to flood the cell." Castro's team designed the capsules to be strong and stable, so that they wouldn't fully disintegrate and release the bulk of the drugs until it was too late for the cell to spit them back out. And that's what they saw with a fluorescence microscope—the cells drew the capsules into the organelles that would normally digest them, if they were food. When the capsules broke down, the drugs flooded the cells and caused them to disintegrate. Most cells died within the first 15 hours after consuming the capsules. A rotating view of a single drug-resistant leukemia cell, after it's absorbed DNA nanostructures. Fluorescent markers show that the nanostructures have been taken deep into the cell, into the organelles that will digest them. Credit: Matthew Webber, The Ohio State University. 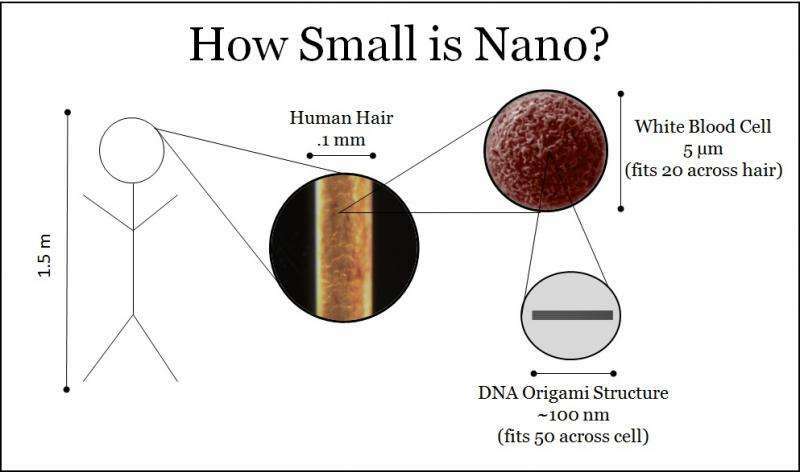 This work is the first effort for the engineers in Castro's lab to develop a medical application for the DNA origami structures they have been building. Though DNA is stereotypically called the "building blocks of life," engineers today use natural and synthetic DNA as literal building blocks for mechanical devices. Previously, the Ohio State engineers created tiny hinges and pistons of DNA. As Castro pointed out, DNA is a polymer—albeit a naturally occurring one—and he and his colleagues shape it into tiny devices, tools or containers by exploiting the physical interactions of the bases that make up the polymer chain. They build chains from DNA sequences that will naturally attract and bind with one another in certain ways, so that long the long polymers automatically fold up, or "self-assemble," into useful shapes. In the case of this DNA Trojan horse, the researchers used the genome of a common bacteriophage, a virus that infects bacteria, and synthetic strands that were designed to fold up the bacteriophage DNA. Although the folded-up shape performs a function, the DNA itself does not, explained Patrick Halley, an engineering graduate student who is doing this work to earn his master's degree. "One of the hardest things to get across when you're introducing this technology to people is that the DNA capsule doesn't do anything except hold a shape. It's just a static, rigid structure that carries things. It doesn't encode any proteins or do anything else that we normally think of DNA as doing," Halley said. In keeping with the idea of DNA origami manufacturing, Castro said he hopes to create a streamlined and economically viable process for building the capsules—and other shapes as well—as part of a modular drug delivery system. Byrd said the technique should potentially work on most any form of drug-resistant cancer if further work shows it can be effectively translated to animal models, though he stopped short of suggesting that it would work against pathogens such as bacteria, where the mechanisms for drug resistance may be different.